This year's BMW Championship selections are now live - click here to view them. Golf Betting System's resident PGA Tour commentator Steve Bamford has previewed this year's BMW Championship below and his final BMW Championship tips will be published around teatime on the Tuesday before the event. Bookmark this page and come back soon! You can follow Steve on twitter @bamfordgolf. After a week's break from competitive action, the PGA Tour moves to Illinois for the BMW Championship which starts on Thursday 12th December 2013. The BMW Championship is traditionally the 3rd leg of the PGA Tour Playoffs, where the Top 70 in the FedEx Cup standings fight it out to grab a golden ticket to the prestigious Tour Championship at East Lake. Introduced in 2007 when the end of season Playoffs were first launched, the BMW Championship was formerly known as the Western Open and it's always been played on the best courses that the Mid-West has to offer, mainly in Greater Chicago or Indiana. 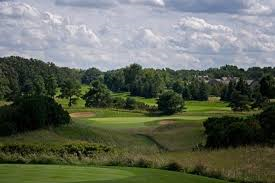 After a period of visits to Cog Hill GCC and last season Crooked Stick GC, the BMW moves in 2013 to Conway Farms Golf Club in the suburbs of north Chicago, a course that has never seen PGA Tour action. Players and punters alike will face a little of the unknown on a course that has been designed around the traditions of Scottish links golf, although the course sits 3 miles inland from Lake Michigan. So the BMW Championship will be played on a relatively new (1991) Tom Fazio design, but players will still have the same twin aims. Winning the tournament will be the target for the whole field, but if that's not possible then ensuring a place in the Top 30 of the FedEx Cup standings at the close of the BMW is critical as only those players will move onto the season ending Tour Championship a week later in Georgia. Don't miss our final BMW Championship tips which we'll publish on the Tuesday prior to the start of this season's tournament. Conway Farms Golf Club, Lake Forest, Illinois. Designer: Tom Fazio, 1991; Course Type: Technical; Par: 71;; Length: 7,216 yards as per the scorecard; Water Hazards: 5; Bunkers: 88; Fairways: Bentgrass; Rough: Kentucky Bluegrass 3"; Greens: 6,000 sq.ft average featuring Bentgrass; Stimpmeter: 12ft; Previous Tournaments Hosted: 2008 US Open Sectional Qualifier, 2009 Western Amateur, 2012 U.S. Mid-Amateur. 2012: Rory McIlroy; 2011: Justin Rose; 2010: Dustin Johnson; 2009: Tiger Woods; 2008: Camilo Villegas; 2007: Tiger Woods. Let's be straight here. The nomadic nature of this tournament makes it a difficult one to call, especially when the tournament - for the second year in a row - visits a course that has never hosted a PGA Tour tournament. Nice! However Conway Farms looks like it will be a far more conservative set-up from the low scoring, Par 72 blast which was Crooked Stick 12 months ago. The Tom Fazio design is a much tighter, Par 71 which features masses of undulation, uneven fairways, severe bunkering and plenty of tough fescue rough. Combine that with plenty of encroaching trees, the likes of which don't feature on links courses, and you start to see that this could be far more like Cog Hill than Crooked Stick in terms of course difficulty and scoring. The recent winners list at the BMW Championship makes for interesting - cream tends to rise to the top at the BMW Championship and it's worth noting that all winners since the tournament's inception in 2007 have been ranked in the World's Top 40 when they teed off in the Mid West. After last year I'm also a believer in the fact that it's incredibly difficult for players that will have contended across both The Barclays and the Deutsche Bank to stay at the very summit of the leaderboard at their third Playoff tournament in a row. OK the scheduling is slightly different in 2013, where the week break has been inserted between TPC Boston - Conway Farms, rather than between Crooked Stick - East Lake which was the case 12 months ago, but the PGA Tour Playoffs feature the world's best playes, many of whom will want a slice of the action to ensure a good FedEx Cup position for the East Lake finale. It's likely that an elite player will win the 2013 BMW Championship, but I'll be looking for those players whose underlying game stats still have room for improvement and whose skillsets marry-up with the tighter nature of this Tom Fazio design. BMW Championship Tips 2013 preview published 16:00BST 21st August 2013.